We haven't had a Twitter war in a while. But alas, the shallow celebs are at it again. 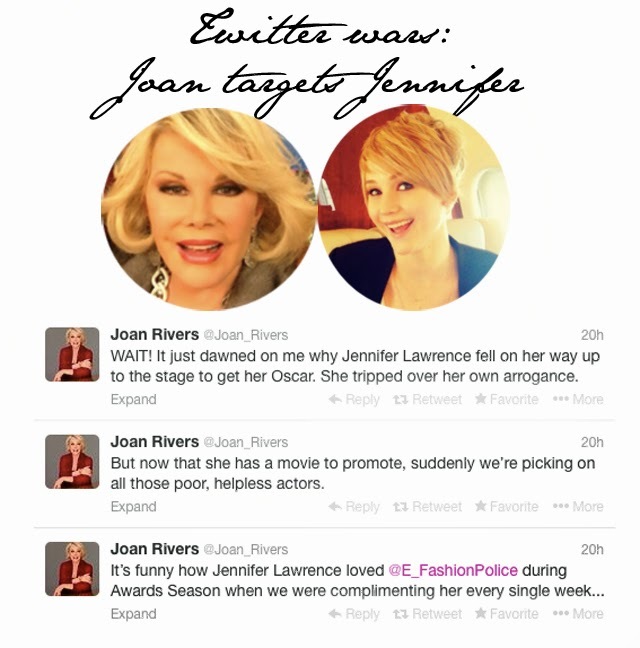 This time Joan Rivers has stepped up to the plate to begin a very public battle with Jennifer Lawrence. To be honest, Jennifer Lawrence more or less threw the first punch. Last week, Jennifer Lawrence sat for a 45 interview with Yahoo! and touched on a number of different topics, including body confidence. Recently, Lawrence has become a champion of speaking out against the industry's push towards what they consider the perfect woman. She's admitted she is who she is, and with very juicy quotes, has more or less told the industry to go screw itself. Well, for one Joan Rivers, Jennifer Lawrence took it too far this time. "Shows like Fashion Police and things like that are just showing these generations of young people to judge people based on all the wrong values and that it's okay to point at people and call them ugly and call them fat. They call it fun and say, 'Welcome to the real world,' but that shouldn't be the real world … There are unrealistic expectations for women. It's disappointing that the media keeps it alive and fuels that fire. It's something that really bothers me ..."
So, Joan Rivers wasn't too happy about the comments. Let's be honest here. Most people in the industry probably don't say much as they don't want to rock the boat with Joan. We're no red carpet celebs, so we have nothing to fear. The woman is a hack and Jennifer Lawrence called her out on it. The fact that Joan Rivers makes money laughing and poking fun at people is disgusting and we're 100% team Jennifer on this one. When it comes to bullying these days, where do you think kids learn it from? Trust us when we say Joan Rivers is their ringleader. We stopped watching long ago and encourage you to do the same.